When Elizabeth Churchill Spalding sent her late husband’s baseball collection to the New York Public Library in 1921, it was comprised of the baseball archives of baseball pioneers Albert Spalding, Henry Chadwick, James Whyte Davis and Harry Wright. The collection included manuscripts, scrapbooks, score books, correspondence and photographs of the pioneers and the men who shaped the game in the 19th century. 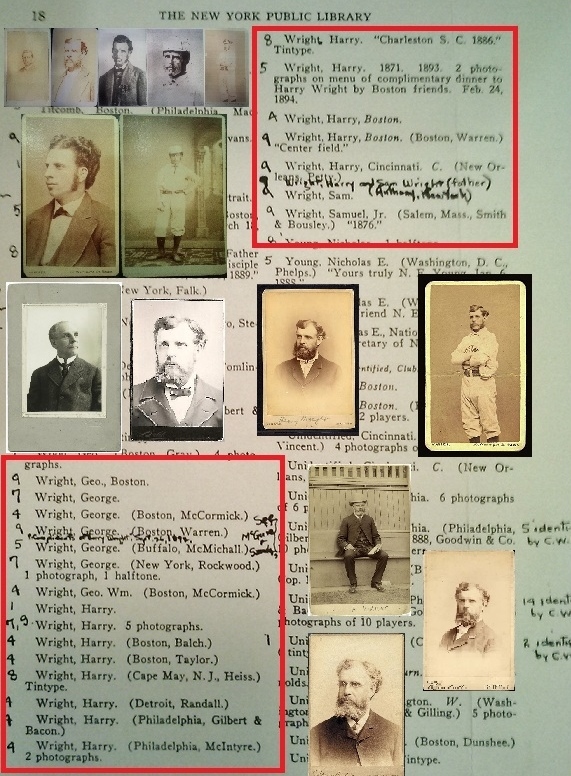 In addition to the manuscript materials, thieves have also looted the bountiful collection of photographs that emanated from Harry Wright’s archive and were documented in the original inventory as including over twenty portraits of the “Father of Professional Baseball” and another ten of his brother, Hall of Famer, George Wright. When the library conducted an inventory of the Spalding Collection’s photographic holdings in 1986, photo archivists could only locate three portraits of Harry and just one of George. It was solid proof that the library thieves were just wild about baseball’s famous Wright brothers. It appears that two of the portraits may have survived because they were likely housed in their original frames (and were not even identified on the 1922 inventory) and the third was a rare Kalamazoo Bat cabinet card of Wright that was one of six duplicates once in the collection (that means the other five have vanished). The Kalamazoo Bat card of Wright is listed as being worth $62,500 in The Standard Catalog of Baseball Cards. To date, the library and the FBI have recovered two more portraits, one a cabinet photo shot by Boston photographer Taylor and an 1872 CDV shot by Boston photographer Warren. The Wright cabinet was identified when it was listed for sale in a Lew Lipset auction in 2005, and the CDV was snagged after being offered for sale on eBay back in 1999. The year 1999 also saw several other stolen Wright photos surface as they hit the auction block at Sotheby’s as part of the Barry Halper Collection. 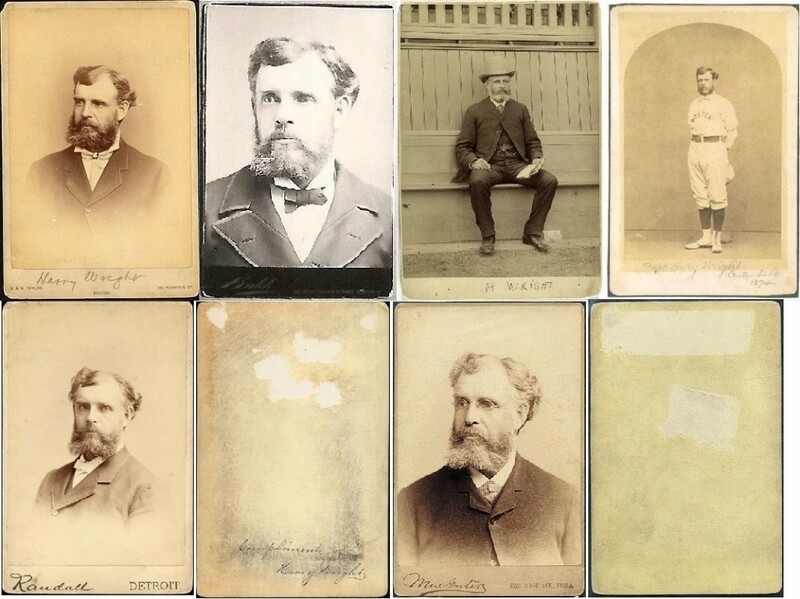 The Sotheby’s auction featured several cabinet photos and a CDV of Wright in dress clothes which appeared as lot 1350. At the same time another CDV portrait of Harry in 1868 surfaced in a MastroWest auction in 2000. A missing tintype of Harry shot in Cape May, NJ, also surfaced in a Barry Sloate auction. All of these portraits of Harry Wright were stolen from the NYPLs Spalding Collection. The examples in the bottom row are presented with the reverse of each card exhibiting defacement of the NYPL ownership stamp and storage designation. After Halper’s death in 2005, his estate and his widow consigned two other Wright cabinet photos to Rob Lifson and Robert Edward Auctions, in Watchung, NJ. One was an inscribed cabinet by Randall and the other a MacIntire cabinet of Wright in spectacles. Both cabinet cards showed the tell tale signs of having once been part of the Spalding Collection with sections of paper loss on each card’s reverse where NYPL stamps and identifications were once located but now defaced. A collector named Ken Wirt, of Springfield, Missouri, purchased the stolen MacIntire cabinet at REA and regularly shows it off on collector forum Net54. This page from the 1922 NYPL guide to the Spalding Collection includes specific inventories for the portraits of George and Harry Wright (outlined in red). 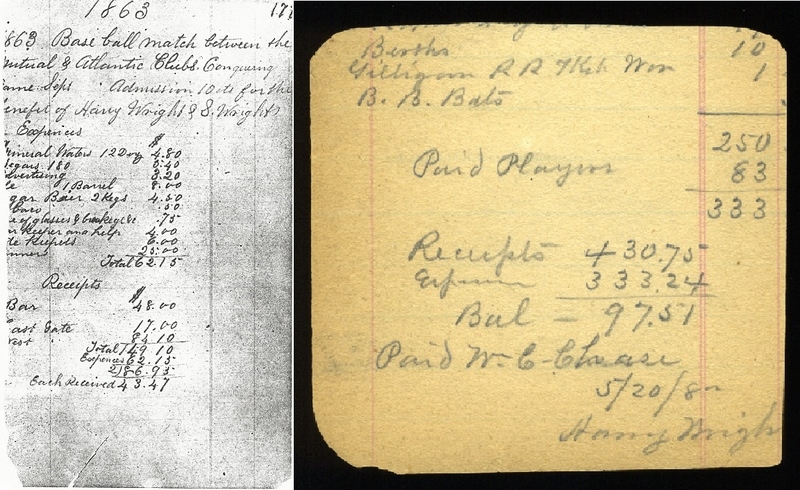 The additional handwritten notes and numeric designations were added by collector and researcher Charles W. Mears. Based upon the surviving and recovered photos still at NYPL (as well as others identified on the SABR contact sheets of photo shoots at the NYPL in 1983 before they were stolen), it appears the NYPL collection at one time had every known portrait of Harry Wright except for one: the standing portrait of Wright holding a ball photographed by Jordan & Co. for the 1863 Grand Benefit Match CDVs. That CDV was purchased in 2000 by Keith Olbermann for over $82,000 in the same Robert Edward Auctions sale that featured the infamous trimmed Gretzky-McNall T206 Honus Wagner. The fraudulent offering of the PSA-8 graded Wagner brought over $1.2 million for Lifson and his then partner, the currently indicted hobby kingpin, Bill Mastro, who had his guilty plea agreement nixed for a second time by a Federal Judge in Chicago yesterday. What are the odds that Harry Wright saved a copy of virtually every other portrait ever taken of him, except for the significant 1863 Jordan & Co. CDV, which he created as a ticket and is documented in his personal notebooks still housed in the Spalding Collection ? 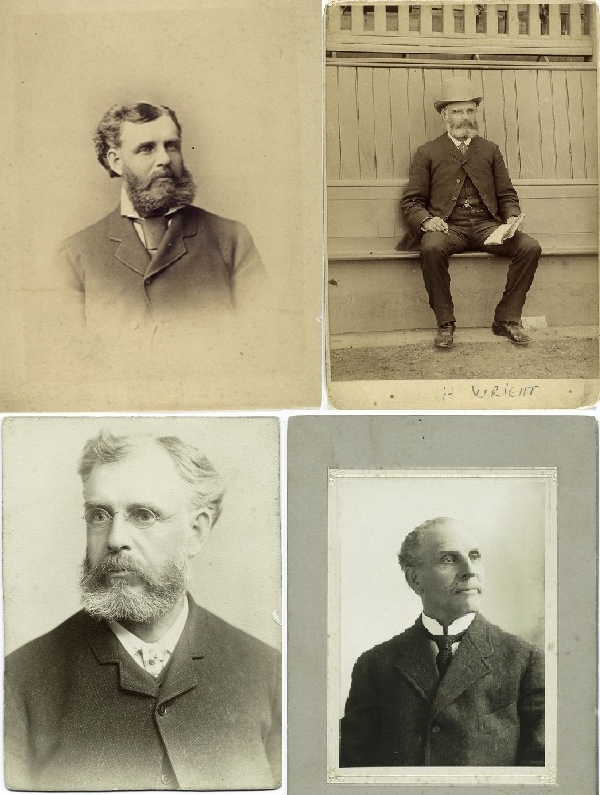 These five portraits of Harry Wright were all featured on CDV photographs once housed in the famous Spalding Collection. The only one that remains in the collection is the example to the far right which was recovered when a seller offered it on eBay in 1999. Of all the CDV photographs of Wright that he saved for himself (and were identified on the original 1922 NYPL Spalding Collection inventory) only one remains and even that one was stolen. That Warren CDV of Wright in his Boston uniform appeared on eBay in 1999 and was recovered by the NYPL when collectors noticed the defaced NYPL stamp on the CDVs reverse. Two other CDV portraits of Wright are documented in published books including A. G. Spalding’s America’s National Game in 1911 and in John Durant’s The Story of Baseball, which includes a credit to the NYPL. There are two tintype portraits of Harry Wright missing from the NYPLs Spalding Collection and there are only two known to exist in private hands having sold at public auction. One sold at "19th Century Only Auctions" (far left and right) and the other by dealer Barry Sloate in 2002 (center). This Warren CDV (left) and McCormick cabinet photo of George Wright were stolen from the Spalding Collection but have yet to be recovered. As we’ve illustrated here, virtually every donated portrait photograph of both Harry and George Wright has been looted from the NYPLs Spalding Collection yet, somehow, the most important of those photos, the 1863 Jordan & Co. CDV of Harry, is somehow accepted as not having been part of the comprehensive Harry Wright collection. Instead, we are to believe that the CDV appeared legitimately along with several never-before-seen CDV’s of George Wright as “unearthed treasures” in a Butterfield & Butterfield auction in 1997, with no mention whatsoever as to provenance. One of the CDV’s was a c. 1866 photograph by Grotecloss featuring George Wright and what appears to be his Unions of Morrisania baseball teammate Tommy Beals. The NYPL’s Spalding Collection lists several “unidentified” Grotecloss CDV’s on its “Missing List” of unaccounted photos. 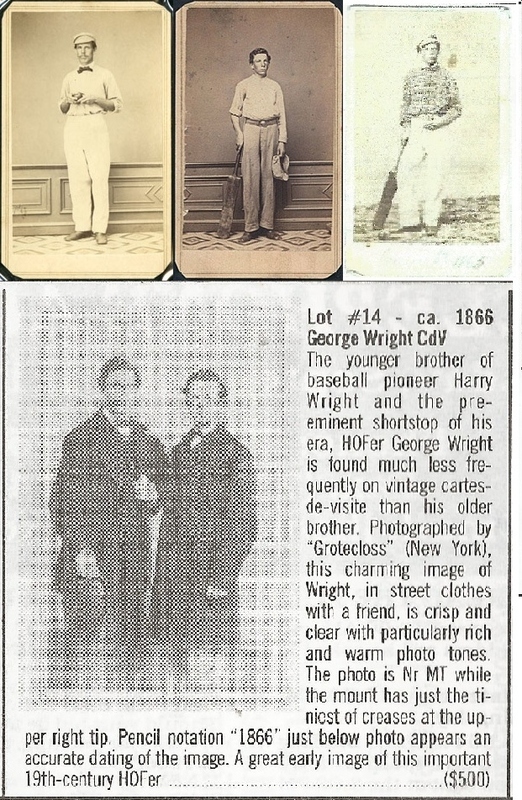 The 1997 Butterfield auction included the Harry Wright Benefit Ticket CDV and several cricket related CDV's featuring his brother George Wright. Another Grotecloss CDV of George with an unidentified "friend" was also included and sold later by dealer Barry Sloate. 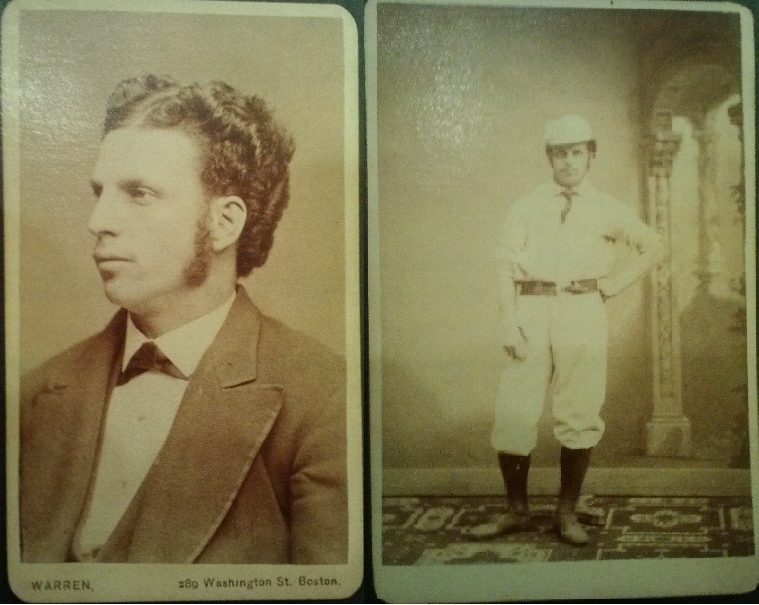 The unidentified friend on the 1866 CDV may be George's baseball teammate Tommy Beals from the Union BBC. From here we will take a much closer look at the history and provenance of the 1863 Jordan CDV of Harry Wright and the circumstances surrounding its discovery in 1997. We will examine the current offering of the card at Robert Edward Auctions Spring sale and review the research that the auction house has published as part of the lot description for the upcoming auction. 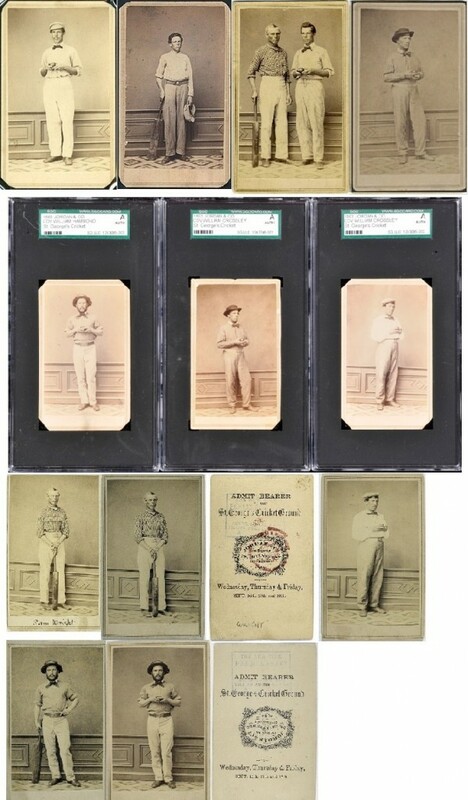 In addition, we will also document the entire population of Jordan & Co. CDVs in both private hands and at the New York Public Library, thus giving a new and fresh perspective on the CDV-ticket issue created and sold by Harry Wright to promote both cricket matches and baseball games in 1863. Just recently Haulsofshame.com confirmed that one of the E. T. Anthony CDV’s featuring Harry and Sam Wright is missing fron the NYPL’s Spalding Collection. The original inventory listed one example but in the 1920’s researcher and collector Charles W. Mears indicated on a subsequent NYPL inventory that the collection featured a duplicate of that same CDV. Mears made a handwritten notation in the NYPL’s master inventory booklet that was examined and documented by historian John Thorn in 1983. There are only four known copies of the E. T. Anthony CDV featuring Sam and Harry Wright. The NYPL had two in its collection but only one remains (far left). Only three other examples have surfaced publicly including one that surfaced in a 1992 Wolfers auction (far right) and two others that appeared in a Butterfield & Butterfield auction in 1997. The first Wright father and son CDV appeared in Richard Wolfers 1992 “Treasures of the Game” auction as the #1 lot with an estimate of $10,000-$12,500. Two additional copies appeared in a Butterfield & Butterfield auction in 1997 allegedly originating from a CDV photo album with an alleged Wright family provenance. With only three examples known to exist in private hands, the odds are great that one of those three examples is the missing NYPL CDV. (A newly discovered Jordan & Co. ticket-CDV featuring a different pose of Sam and Harry Wright appears as lot #7 in REA’s current sale). With the confirmation that the CDV featuring Harry and Sam Wright is missing, are all of the Jordan & Co. CDV-tickets that were originally part of the Spalding Collection in 1922 accounted for? Pretty soon, everybody will forget what our famous baseball Wright Brothers looked like. Good one Dorothy. Perhaps that’s why on eBay every bearded man featured on a period tintype is alleged to be Harry. Wow . . . really interesting. Great work and thanks for sharing. Wow, a high 50,000 reserve on that harry wright cdv and no opening bid yet. Guess we know why now. We also contacted the New York State Attorney General’s office dedicated to Charities and Public Trusts to inquire what responsibilities an institution like the Hall of Fame has when they are made aware that items from their collection have been stolen and sold. As of the date of the publication of this article, we were unable to confirm what those responsibilities are.